The second film in as many weeks in which there’s a VHS copy of The Right Stuff on display – Captain Marvel recently picked one up in a Blockbuster store. But Jordan Peele’s follow up to Get Out is a very difference kettle of fish to the latest Marvel chapter. What it is is a remarkable horror movie, that moves from childhood nightmare to brutal home invasion movie to a trip down Alice’s rabbit hole – literally! - to emerge as a altogether frightening series of neo-apocalyptic Hands Across America-inspired visions. 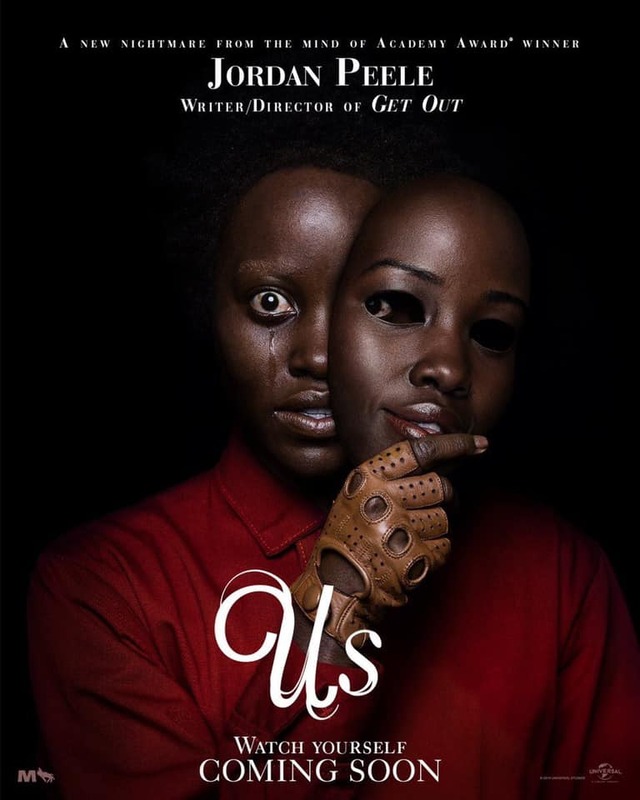 Lupita Nyong’o’s Adelaide has an initial terrifying experience as a child in a house of mirrors – a key motif of reflection that will come back to haunt both her and us. Years later, she and her nuclear American family, return to the same beach where this other-worldly occurrence occurred and things start to spin out of control. To keep it brief – and we’ll keep it brief, because the less you know going in the better this works - she and her family find their idyllic holiday home invaded by what appear to be identical dopplegangers of themselves i.e. “us.” They refer to themselves as being “tethered” to their mirror images…and that’s only the starting point. Whilst Peele’s sophomore effort deliberately eschews the obvious racial issues and satire of his debut, it is in many ways a far more deeply unnerving film that – try as it might to avoid – can’t help but comment on the current state of his homeland. The “tethered” define themselves as “Americans” with a creepy smile and it is in many ways as much a look at the collapse of the contemporary American family unit as it is a celebration of the resilience of same. But as such it is a portrait of said unit that can’t help but spill out – and all over - the country as a whole. It starts to come undone slightly when the third act seeks to offer some explanation, something the supernatural nature of it doesn’t necessarily need. But, despite this tangent, it remains brutal, terrifying, unnerving and nerve-shredding – whilst wisely never losing sight of the fact that humour is more often than not the perfect complement to such horror. Peele clearly knows his stuff and the influences of not only Alice In Wonderland, but Haneke’s Funny Games, through to Invasion of the Body Snatchers – the 1979 Philip Kaufman version (hence The Right Stuff reference presumably) are all on display to see, and admire. But this is the work or a genuine original – just witness that final reveal and that final shot. Peele’s next opus is rebooting The Twilight Zone for TV. They couldn’t have picked a better man for the job. All hail the new Rod Serling.